19. 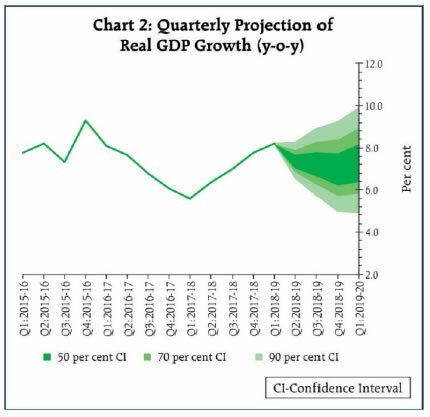 Turning to the growth outlook, the GDP print of Q1:2018-19 was significantly higher than that projected in the August resolution. Private consumption has remained robust and is likely to be sustained even as the recent rise in oil prices may have a bearing on disposable incomes. Improving capacity utilisation, larger FDI inflows and increased financial resources to the corporate sector augur well for investment activity. However, both global and domestic financial conditions have tightened, which may dampen investment activity. Rising crude oil prices and other input costs may also drag down investment activity by denting profit margins of corporates. This adverse impact will be alleviated to the extent corporates are able to pass on increases in their input costs. Uncertainty surrounds the outlook for exports. Tailwinds from the recent depreciation of the rupee could be muted by the slowing down of global trade and the escalating tariff war. Based on an overall assessment, GDP growth projection for 2018-19 is retained at 7.4 per cent as in the August resolution (7.4 per cent in Q2 and 7.1-7.3 per cent in H2), with risks broadly balanced; the path in the August resolution was 7.5 per cent in Q2:2018-19 and 7.3-7.4 per cent in H2. 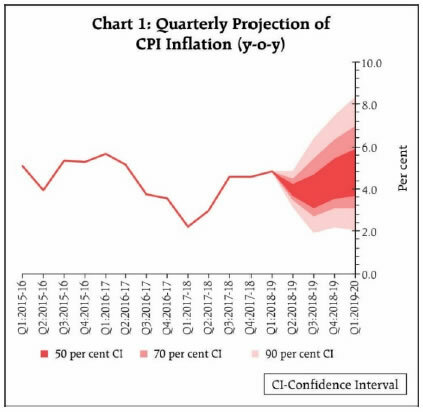 GDP growth for Q1:2019-20 is now projected marginally lower at 7.4 per cent as against 7.5 per cent in the August resolution, mainly due to the strong base effect (Chart 2).